Avery is fresh out of high school and starting college across the country. All alone, away from her family, her home and her small town... She needed to leave, she was suffocating, she was scared and the taunts and gossip were never going to let her forget. It's been years since Avery has had a friend and although weary, she finds herself becoming accustomed to collage life... That is until she is swept off her feet by Cameron, literally. Being with Cam is... Easy. He's thoughtful, polite, and comes in a packaged deal with Rafael, his pet turtle. Soon Avery finds that her friendship with Cam feels foreign as she starts to develop feelings for him. She can't trust him, and her secret could destroy any relationship she has with Cam, even before it begins. Can Avery overcome her past and heal? It's time she faces the fears that hold her back, beginning with her parents. It was a touching story of how friendship can be the basis of a beautiful and loving relationship. It's far more realistic than most New Adult books and the character development didn't feel rushed. Avery is a strong character who really does survive a harrowing experience and shows that, with help, that she deserves to be happy and free of her past. My only complaint is that I was hoping for an epilogue... I really needed an epilogue! Unless there may be a new series on the horizon f0r Jennifer L Armentrout fans. 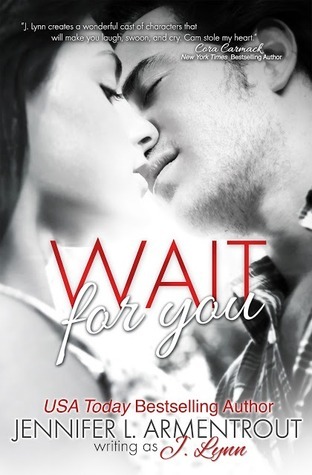 Wait For You sounds very interesting. I usually only read romance novels during the summer when I am looking for something quick to read. Hi Carol and thanks for commenting. I thought I would read a few light and fluffy romances in between my usual dystopian, apocalyptic and paranormal reads, but they are becoming a chore to read. I find that there are no surprises with new adult anymore.